Quats are well-known antiseptics and have a long history of use in topical products such as antiseptic liquids, creams and gels. They act on a wide range of microorganisms, from gram+ to gram- bacteria, moulds and yeasts. Our FeF™ Quats are odourless and colourless, and their effectiveness in all pH ranges combined with their ability to mix well in both aqueous and oily phases, make them an ideal antimicrobial ingredient. tissue, it is necessary to utilize only the purest and safest ingredients. All our FeF™ Quats products are widely used in both human and veterinary topicals. Skin cleansing solutions: FeF™ Benzalkonium Chloride (BKC) are used for cleansing skin, mucous membranes, and wounds with a concentration of 0.01 to 0.1%. w/w, and more dilute solutions are suitable for irrigation of deep wounds. Antiseptic creams: FeF™ Benzalkonium Chloride (BKC), FeF™ Cetrimide and FeF™ CTAB are often found in antiseptic creams used in the treatment of nappy rash, eczema, psoriasis, acne and other dermatoses at concentrations varying from 0.1 to 1%. Hair products: FeF™ Quats are also used in hair products, or example to treat seborrheic dermatitis. Spermicide: FeF™ Benzalkonium Chloride (BKC) is widely used in spermicides in foams, creams and ampoules. Since Quats act on the surface and not on the content of cells, they do not trigger antibiotic resistance. Quats should not be classified as skin sensitizers but as skin irritants. Bromides are less irritating to the skin than chlorides. Quats are relatively non-toxic in use concentrations and only considered harmful in concentrated forms. Tertiary amines are used in the manufacture of Quats; free amine is a possible impurity and can be responsible for skin irritation. FeF™ Quats are carefully manufactured with synthetic raw materials from qualified suppliers, and our validated processes are fully controlled to obtain the lowest possible content of impurities. Solubility: Quats are miscible with water or lower alcohols, such as methanol, ethanol and propanol in all ratios. Quats are not miscible with benzene or ether. ganates, salicylates, silver salts and tartrates. Incompatibilities have also been reported with other substances including aluminium, fluorescin sodium, hydrogen peroxide, kaolin and some sulfonamides. Stability: 5 years shelf life. Other: Odourless, Colourless, Easy to formulate, Surface active / adhesive, Non-volatile and very stable. FeF™ Quats are effective at all pH levels. However their effectiveness increases when the pH increases. The higher the pH, the lower the concentration needed to obtain an antimicrobial effect. As opposed to bacteriostatic/fungistatic compounds which only prevent micro-organisms from dividing (growing), Quats are bactericidal/fungicidal, meaning they will kill micro-organisms, whether they are in a growth phase or not. only work if the micro-organism is in a growth phase and so, cannot be used as an antimicrobial. FeF™ Quats have been tested against several relevant microbial strains, and shown to be effective against a wide range of micro-organisms at low concentrations. FeF™ Quats are compared here with ethanol and with a positive control containing Meropenem (a broad-spectrum antibiotic). 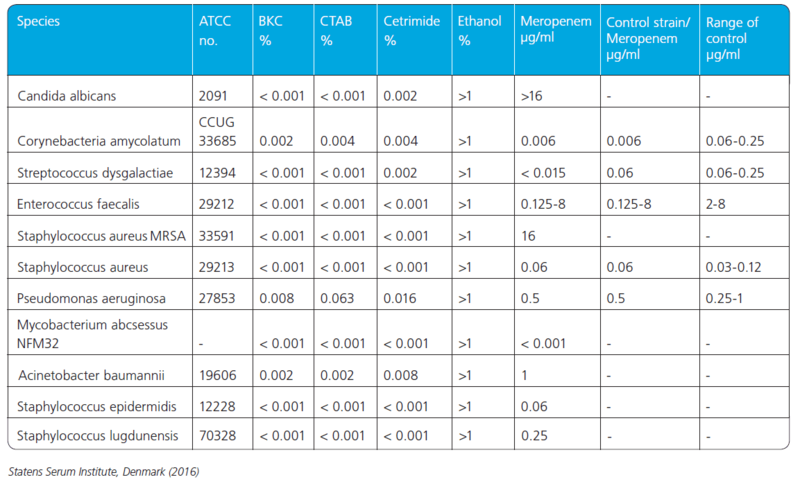 Table 1: Minimal Inhibitory Concentrations. Mean results in % or μg/ml. Novo Nordisk Pharmatech’s products are not registered as biocides in the EU. If you manufacture and/or commercialize products for biocidal use within the EU, please read the Biocide Directive.